Close to everything… yet a world away. Quaintly set on the grounds of Thornewood Estates next to Thornewood Castle on American Lake, this newer home offers the unmatched blend of privacy and luxury comfort in an exclusive historic setting. Ideal for vacations, extended corporate stays, relocations, visiting family/friends or interim housing while building, remodeling, or moving. Thornewood Cottage sits in a very private gated 18 home community on the east shore of American Lake in Lakewood . 10 min to Tacoma, 15 min to Chambers Bay, 15 min. to Olympia, 40 min to Seatac Airport, and 55 min. to Seattle. New construction in 2005, this home is very clean and new. 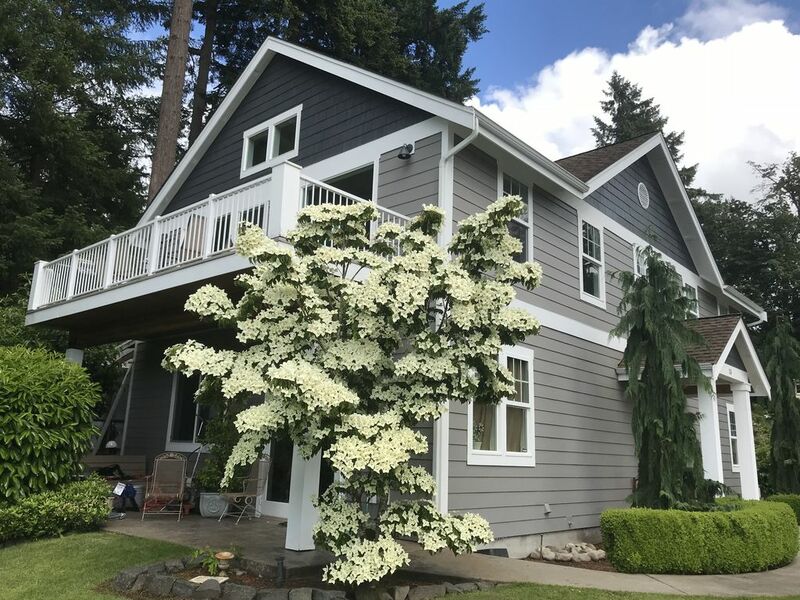 1,400 square foot open layout features vaulted great room with gas fireplace, and a large deck over looking sweeping views of American Lake, the Olympics, and incredible Summer sunsets. Master Suit– king 4 poster bed, jetted tub, large shower, walk in closet, skylight, TV/DVD, and vaulted ceilings. 2nd Bedroom – Queen Bed, vaulted ceilings, walk in closet. 3rd Bedroom has a queen bed and Armoire closet. Kitchen has a large breakfast bar, and plenty of gathering space. Fully stocked with everything. You just bring the food and drink. Great room has a queen sleeper sofa and also features TV, DVD/CD/VCR, theater surround sound, dishwasher, washer/dryer, and custom lighting. All living space is on the second floor. Main floor and garage are not included in rental. Extended stay rates are also available. Call for current rates and availability. It is difficult to describe the history, views, privacy, and unique setting of this home until you experience it for yourself. Since I first built this home as a vacation home in 2005 over 200 families have all loved it. Your own very private beach and dock. The gated neighborhood has a ton of history as the original estate of Chester Thorne a very successful business man around 1900. He built ThonrewoodCastle as a weekend place for he and his wife Anna. The private gated and very secure and peaceful yet you can be in the city in 15 minutes. Enjoy your own private beach and dock. Tacoma Country and Golf Club is just down the lake. You can see the club house from the dock. American Lake - 40' of no bank sandy beach with a dock. Comfortable for our family of 6. Nice place to jump to Seattle or Portland. Beautiful, safe community. Thank you for choosing Thornewood Cottage. We are glad you enjoyed your stay and hope you return soon. Rates for first 2 guests. Each additional guest - $15/night Holidays and graduation periods (PLU/UPS) - 4 night min. Add $60/night. Call for discounts on 7+ night and monthly stays. Possible last minute deals. Please inquire.